On this election day, I thought I would bring forth a look into another great political comedy. “The Campaign” is the perfect choice. 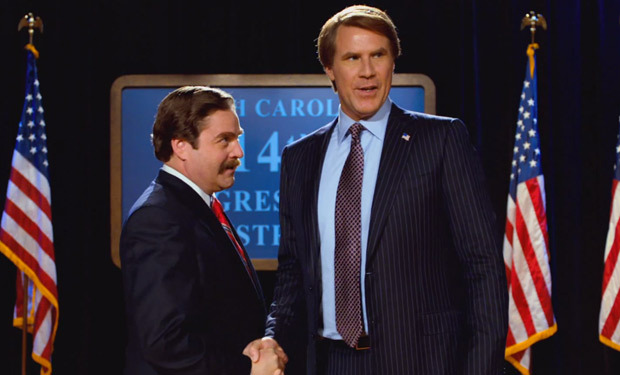 Arrogant, philandering, congressman Camden Brady (Will Ferrell) is running for his fifth term unopposed. It should be a cakewalk for the seasoned veteran but when a sexual tirade to his mistress (Kate Lang Johnson) goes to a wrong number, his likeability begins to plummet. Enter: Marty Huggins. Huggins (Zach Galifianakis) is the city’s local tour guide. He’s naive, boyish and bewildered when his rich political savvy father (Brian Cox) tells him two millionaires (John Lithgow, Dan Aykroyd) want to finance his campaign against Brady. Huggins says yes not knowing what he is getting himself into. Brady is the Democrat vs. Huggins the Republican. Game on! Ferrell plays Brady like he has done countless times on SNL but with the flare of Ricky Bobby thrown in for good measure. 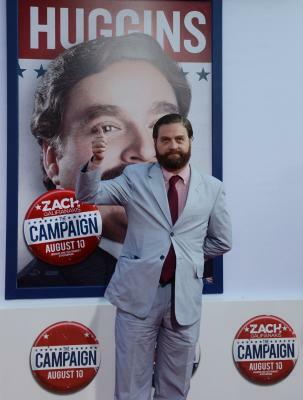 Galifianakis is making a departure from his always odd off-putting characters playing the innocent but him being a straight-arrow is a joke unto itself. I love how the movie tells us anyone can be a politician. The character of Huggins shows us what it’s like being a newbie in politics but also shows us how big money can takeover a campaign. Was it just me or did the brothers Aykroyd/Lithgow remind us of the Duke Brothers (Ralph Bellamy, Don Ameche) from 1983’s “Trading Places”? The movie is directed by seasoned comedy veteran Jay Roach and you can see his influence from the first scene. Roach rose to fame by directing the Austin Powers movies. But really this is Roach’s third political movie. He directed the utterly brilliant film “Recount” about the Florida voting fiasco. He also just finished “Game Change” with Julianne Moore playing Sarah Palin. Those movies have prepared him for this film. And you can just tell he had a ball making it. There is so much confidence, great comedic timing and solid performances. The movie has a brilliant first forty minutes but Roach did finally make a fumble. He didn’t keep his reins tight on Will Ferrell and that one meltdown scene was once again “angry child” Ferrell running rampant. What is with Ferrell and that character it’s like the Energizer Bunny? Put it away, already! Ferrell’s angry child persona deep sixes this really smart and promising movie. I often wonder what the movie would have been like if from that scene on was reworked. That last 25 minutes is a whole other movie. So no matter who you vote for this election day, will you give this movie your vote to see?